Libraries and librarians are the subject of a rich set of clichés. Simply searching for ‘librarian stereotype’ on Google offers plenty of choice, and ‘Librarians in popular culture’ has its own Wikipedia page. Not all of these are negative by any means. The focus on detail, the quiet, the books – these are what make libraries so attractive for many. Yet sometimes the clichés are harmful, at least when they lead to a sense that libraries are nice-to-haves, but not 100% necessary. And despite the evidence, they keep coming back. 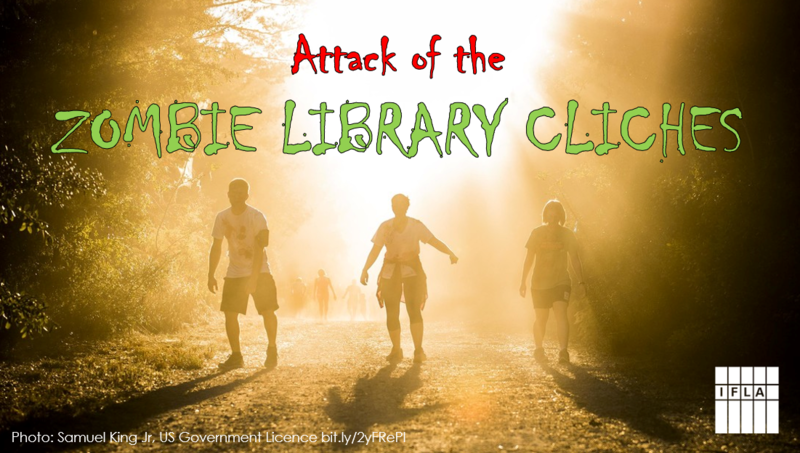 In short, some library clichés are like zombies, returning from the dead. And so, to mark Halloween, below are five common zombie clichés, and some ideas for how to fend them off! 1. Libraries are only about books: So it’s true that the word library in English (as well as variants on Bibliothèque in other languages) come straight from the Latin and Greek words for ‘books’. Clearly, it is also a love of books that draws many people to our institutions are well – to visit, or to work! Yet libraries are showing, every day, that books are just part of the offer. They are valued as a quiet, non-commercial space to work or find peace, to meet with other members of the community, to learn and develop new skills, and to discover new ideas and experiences. And of course, they often also lend tools, or other non-book items to people! So while books remain central to the work of many libraries, they are so much more. 2. Libraries have been replaced by the Internet: it may be true that some of the most simple requests – what is the capital of the Netherlands for example? – have long been taken over by the Internet. But there’s a big difference between some of the functions of libraries being taken over, and libraries as institutions being replaced. While the most novel thing about the ‘fake news’ phenomenon may be the attention being paid to it, it has underlined the importance of media and information literacy. This is the ability to know when you need information, and then to find, understand, evaluate and apply it. And this is where libraries are the masters. With the abundance of information available today, the need for libraries as guides, and as trainers, has never been greater. 3. Librarians are quiet: this is obviously just one of the clichés about librarians themselves, but it’s a powerful one. But is it true? Anyone who has come to the World Library and Information Congress will clearly know different, but librarians are engaged – and active – throughout the year. The Bibliotecarios Al Senado (and now Bibliotecarios a la Calle) movement in Latin America shows that librarians can be militant. All the librarians who have engaged in the International Advocacy Programme – see our updates – prove the same thing. Libraries can protest, and speak up in favour of their services and users. As the IFLA Global Vision underlines, Every Librarian an Advocate! 4. Libraries compete with bookshops: there is an instinctive belief among many, both in government and publishing, that libraries represent a form of competition for bookshops, and that every library loan is a lost sale. Such arguments are used to justify restrictions on eLending, as well as higher costs and royalties. Fortunately, this is not an area where the evidence supports the claims. It is clear that library lending acts as a ‘shop window’, allowing people to try out new books first at the library, before going to buy the next one. According to one survey, over 50% of library users bought a book by an author they’d discovered in the library. It is also an investment. In the case of children’s books for example, the work of libraries to develop literate, book-loving young people helps create more higher-skilled, book-buying adults. And of course libraries are often major customers of bookshops. Libraries and bookshops share the goal of promoting literacy and a love of reading – society as a whole will gain from success. 5. No-one goes to libraries: when IFLA works with some politicians, it is clear that their impression of libraries dates from their childhood or student days. And because they haven’t been to a library in the meanwhile, they tend to believe that no-one else has either. The same, unfortunately, goes for many media commentators – usually people wealthy enough to be able to buy their own books, or too busy to read anyway. But libraries are popular! Where funding has been sustained (and opening hours with it – for example in France), there has been no significant drop in the numbers of people coming through the doors. They may not be borrowing so many books, but they are there for other reasons, such as those mentioned above. And even in countries which have seen major cuts such as England, libraries have seen more visits than cinemas. So be sure to correct the politician who claims that no-one uses libraries – invite them to visit so they can see for themselves!